The word, “evangelism” strikes fear in the hearts of many Christ-followers. But nothing could be more backwards, for the people of God possess the greatest news in the universe. A holy God sent his Son, the Lord Jesus to die in the place of every person who would ever believe. Sinners may receive the hope of eternal life by banking all their hope in Christ and the benefits he purchased for them on Calvary’s cross. J. Mack Stiles helps Christians develop confidence in the responsibility to tell the nations about Christ in his excellent little book, Evangelism. 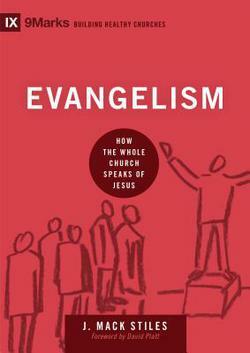 The author rightly responds to churches who turn the evangelistic endeavor into a mere program. Rather, he encourages the church to develop a “culture of evangelism” which is “built on people filled with the power of God’s Spirit proclaiming the gospel of God’s grace in the context of their everyday lives and relationships.” The main theme, then, is built around an entirely different paradigm; a mindset that can and should dominate every local church. Stiles endorses a modified definition of evangelism that I rather like: “Evangelism is teaching the gospel with the aim to persuade.” Such a definition works well in the pulpit, classroom, local park, and coffee shop. Francis of Assisi may have been well-intentioned when he quipped, “Preach the gospel, and if necessary use words.” But wordless evangelism is no evangelism at all (no offense to The Wordless Book – which actually uses words, in the final analysis). Stiles speaks emphatically, “There is no evangelism without words.” Such a gospel should include important words that include God, man, Christ, and human response. Such a culture becomes a reality when God’s people put the gospel at the center of every activity. The gospel emerges in every song, every sermon, and every classroom. In this gospel-centered culture, people are equipped – prepared and passionate about presenting Christ to lost people. J. Mack Stiles has written a fantastic book that I commend to Christians – not only to read, but also to absorb and apply. Perhaps the harvest is just around the corner! The Case For Christ by Lee Strobel, a former atheistic journalist turned pastor, retraces his spiritual journey by interviewing thirteen leading scholars and authorities. Strobel asks penetrating questions and forces these scholars to defend their views with solid data and argumentation. He plays the role of “devil’s advocate” and asks questions that a typical skeptic might ask. The author hopes to challenge the presuppositions of the reader and force him to think through various questions that affect his eternal destiny. He drives home the point that if Jesus is to be believed, then nothing is more important than a proper response to him. Part one examines the Scriptural record detailing the life of Jesus. Strobel examines the biographies of Christ and challenges their veracity. He determines whether the biographies of Jesus were preserved for modern readership. He searches for evidence of Jesus’ life and teaching outside the gospel accounts. And he sets out to verify whether archeological evidence exists that bolsters the claims of Christ. Despite the Strobel’s rigorous questioning of the hard data, the case for Christ emerges victorious. Part two turns from the record of Jesus to the man himself. Strobel seeks to determine if Jesus was really convinced he was the Son of God (as opposed to films like The Last Temptation of Christ) which portray Jesus as a doubting, insecure person. Strobel interviews Gary Collins to determine whether or not Jesus maintained his sanity throughout his life. Was he a lunatic? Was he crazy? Or was he truly who he claimed to be – the eternal Son of God. In his interview with D.A. Carson, the author sets out to determine whether Jesus’ attributes really matched the attributes of God’s. And finally, the author meets with Louis Lapides a converted Jewish pastor to determine if Jesus is really the long-awaited Messiah. Part three examines the evidence for the resurrection. Strobel’s interview with Alexander Metherell, M.D. is fascinating and convincing as they challenge the so-called Swoon theory and come to terms with the fact that Jesus really did die on the cross. Strobel questions the eminent philosopher, William Lane Craig on the evidence for Jesus’ missing body. The post-resurrection appearances is discussed with Gary Habermaas. And the circumstantial evidence supporting the resurrection of Christ is supported by J.P. Moreland. The author draws the book to a close by challenging the reader with the evidence. He recalls his own personal story that brought him to this point: It would take more faith to adhere to atheism than trust in Jesus Christ! In the final analysis, he lays the evidence at the feet of the reader and forces him to make a decision. In light of the evidence for Christ and his unique claim to be God, a choice must be made. Strobel presents a simple gospel message and the reader is left hanging in the balance. The Case For Christ is a terrific book. Many strengths run throughout Strobel’s fine work. First, he interviews credible scholars. These men argue the claims of Christianity with clear and passionate argumentation. The author’s selection of scholars is noteworthy. He really picks the cream of the crop. I was particularly pleased with his decision to interview D.A. Carson and J.P. Moreland. Second, the book helps skeptics to see the issues and examine all the pertinent questions. There is no hint of subterfuge in this book. Not one hint of evidence is hidden from the reader’s eyes. Third, Strobel’s book builds the faith of believers. The evidence presented only bolsters one’s faith and confidence in the written record and unique claims of Christ. Fourth, this work vividly shows the validity of classical apologetics, otherwise known as evidentialism. Fifth, the book is intensely practical. The reality of Jesus Christ and his claim to be God point to the practical effect of following him in daily life. It really does help promote devotion on the part of the believer as well as foster decision-making on the part of the lost. I am excited about using this book in the future as I dialogue with lost people and challenge them with eternal issues. I am also excited about passing Strobel’s book to believers to build their faith and help them in the everyday challenge to evangelize the lost. Michael Horton has been on somewhat of a writing streak in recent days. Earlier this year, he released his magnum opus, The Christian Faith, a systematic theology that ranks highly along with theologians such as Wayne Grudem and Robert Reymond. In 2008 he embarked on an important study that included Christless Christianity and The Gospel Driven Life. Horton completes this theological trilogy with The Gospel Commission: Recovering God’s Strategy for Making Disciples. Horton’s work articulates the Great Commission in a compelling way that motivates followers of Christ to welcome others into God’s covenant family and challenges the presuppositions concerning the evangelistic task. Horton wastes no time in critiquing ancient heresy and alerting readers to the alarming contemporary trends associated with the emergent church. The author helps recover the core elements of the Great Commission and invites readers to seriously consider the mandate before every Christ-follower. The Gospel Commission is challenging and convicting. It is an important reminder and calls God’s people to remain faithful to the task. Books on evangelism are a dime a dozen these days. Much of what passes for “evangelism” is watered-down, pragmatic, and in the final analysis promotes a different gospel (Gal. 1:6). Tell the Truth by Will Metzger stands head and shoulders above every other book I’ve read about evangelism. The subtitle is a nice summary of this excellent book: “the whole gospel to the whole person by whole people.” Metzger’s Reformed approach to evangelism is saturated in Scripture and confronts the man-centered approach to evangelism with a vengeance. The heart of the book is to communicate a proper view of God and a proper view man. Metzger rightly adds, “We cannot explain the work of Christ unless we present a true picture of God.” The author prizes God-centered theology and roots healthy evangelism in the biblical reality of predestination. But note: there is no fatalism here. Metzger embraces the notion popularized by Jonathan Edwards: “God ordains the ends and God ordains the means.” To that end, the author promotes a rigorous approach to evangelism; a kind of evangelism that pleads with sinners to repent of their sin and place their faith in Christ alone for salvation. Readers familiar with Spurgeon’s approach to evangelism will be instantly drawn to this work. The sovereignty of God in salvation is emphasized. As such, “sovereign saving grace gives power to obey, as well as grants a pardon for disobedience.” But the responsibility of man is equally emphasized. Simply put, the sinner (who is unable to believe apart from sovereign grace) must believe. Metzger calls Christians to speak the truth in love (Eph. 4:15). This is the high calling of every follower of Christ. He reminds readers, “Action should be the fruit of sound doctrine.” Tell the Truth is a powerful primer on the mandate to evangelize lost people. Highly recommended! Mark Dever has been greatly used over the years to help and encourage pastors faithfully shepherd the flock. He continues to exercise his gift by encouraging pastors and all Christ-followers to evangelize lost sheep – so they might be among the flock. His book, The Gospel & Personal Evangelism is written with this end in mind. 1. Why Don’t We Evangelize? Dever stresses the importance of the evangelistic mandate. He emphasizes the God-centeredness of this task: “The redemption of an eternal soul is one sale that we, in our own strength , cannot accomplish. And we need to know it, not so that we won’t preach the gospel, but so that we won’t allow the gospel that is preached to be molded by what finally gets a response.” And Dever reminds us that failure to evangelize is, in the final analysis, tantamount to disobedience: “We do not fail in our evangelism if we faithfully tell the gospel to someone who is not subsequently converted; we fail only if we do not faithfully tell the gospel at all.” May Dever’s words be met with faithful, passionate, Christ-centered, Word-centered proclamation – so that nations might know of God’s great love and the provision he made in his Son for everyone who believes! Jesus the Evangelist by Richard Phillips cuts to the core of the evangelistic task. The purpose: to study key chapters in John’s gospel and learn evangelism from Jesus himself. In part two, the author zero’s in on Jesus’ witness to Nicodemus and unpacks a theology of the Gospel. He stresses Christ’s imperative in John 3, “You must be born again.” A strong emphasis is rightly placed on monergistic regeneration. Specifically, God alone regenerates the human heart. There is no human cooperation. And sovereign regeneration enables sinners to believe the gospel. Part three includes a discussion of Jesus’ witness to the Samaritan woman and includes Jesus’ method or practice of evangelism. The author spends time developing Jesus’ dynamic approach to evangelism and shows how he deals directly with sin. Jesus the Evangelist is an important tool that should be utilized by anyone who has a passion for lost people. This work is unique because it provides a solid theological framework for evangelism and a workable methodology.